These brief notes describe a pump, invented and developed by a colleague of ours in New Zealand, which we are now starting to send to African water development projects. It uses a very simple pumping principle made possible by the availability of strong lightweight PVC pipes. It can be placed on a well to lift water from depths of at least 8 metres. Below ground the pump consists of two pipes, one slightly larger than the other. At the bottom of each pipe is a simple non-return valve. An up and down movement of the handle raises and lowers the inner pipe or plunger. The outer pipe remains still. As the plunger is raised it lifts a column of water within it and more enters the outer pipe through its non-return valve. Each time the plunger is pushed down, more water is forced into it from below. Continued movement of the plunger drives water to the top of the inner pipe where it runs out through the pump spout. The pump is self-priming and easy to maintain. The valve seals are flat rubber discs which may be cut from old tyre inner tubes. As long as these discs are in good condition the pump holds its prime and yields water immediately. No piston seals are needed. We believe that this pump has an important role to play where small scattered communities have access to numerous shallow wells. Although in trials one pump was run continuously for nearly 10 million cycles without any problems, we see this as a family pump for use by just a few compounds rather than one for very large villages where pumps have to be engineered to withstand very heavy use and abuse. The pump is very easy to assemble and maintain using the minimum of tools. It lends itself to local manufacture. SWS Filtration has a charity account which allows us to provide small numbers of pumps entirely free of charge of to bona fide development projects and where the pumps would be monitored closely. Please contact us if you think you would qualify for assistance. SWS Filtration Limited, Hartburn, Morpeth, Northumberland, NE61 4JB, England. 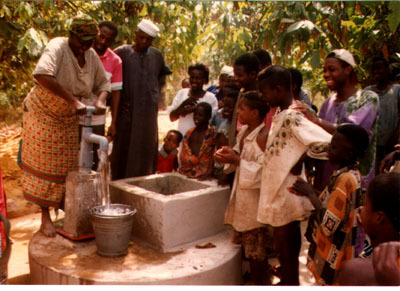 In 1997 thirty New Zealand Hand Pumps were sent to Ghana for installation in villages for evaluation by the Ghana Water and Sewerage Corporation. The pumps were installed by a Ghanaian who had indicated his desire to start local manufacture of the pumps in Accra. These pumps were developed from the very successful New Zealand "Drumpump" - a pump, as its name suggests, for drawing fluids from drums. 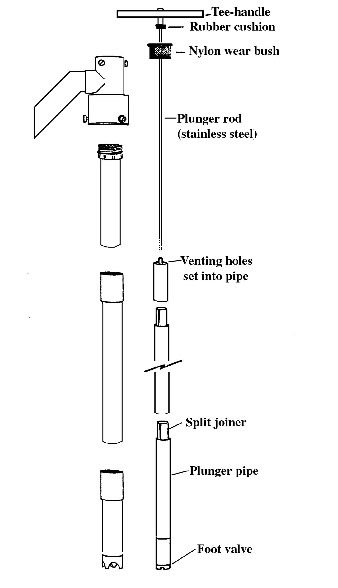 The basic principle of operation remains exactly the same with water moving up an inner pipe to the surface; it passes through a perforated fitting set directly into the top length of the inner pipe before pouring out of the pump spout. Several important benefits resulted from this change. First, the amount of wear was greatly reduced. Secondly, the stainless steel rod allows for a longer stroke than before. This lets the pump-head be set closer to the ground making it easier for children to use. (Adults can simply raise the plunger further and operate the pump at a height comfortable for them.) At the same time, the pump stand can be shortened to allow buckets be filled at the lowest possible height thus avoiding the water being lifted further than necessary. Finally, and somewhat unexpectedly, reports suggest that the hydraulic performance of the pump was also improved.